'There is something absolute about the letters between you & me; … The letter is a form of communion of the soul-spirit – … one that is faded & yet unimpeded, complete’, wrote Martin Heidegger to his fiancée Elfride Petri shortly before their wedding. In the course of a marriage that lasted almost sixty years Martin and Elfride were often apart, and the letter thus remained a vital means of communication right through to the final years. The letters he sent her are snapshots of the ups and downs, the crises and everyday minutiae from Heidegger’s life: their engagement, the building of the Cabin at Todtnauberg, the part he played in the two world wars, the difficulties of his early professional career, their financial problems, his dealings with women, and his constant concern with expounding his ideas. Apart from three letters now in the hands of the German Literature Archive in Marbach, Elfride Heidegger kept all of the countless letters and cards from her husband locked away in a wooden chest. After reading them one final time, in 1977 she gave the key to this chest to her granddaughter Gertrud Heidegger on condition that she should not open it until after Elfride’s death. After years spent deciphering, transcribing and ordering the letters with the help of her father and her uncle, Gertrud Heidegger has here made a selection of them available to the public and added a commentary that provides relevant background material. This selection from the many letters written by Martin Heidegger to his wife provides an invaluable insight into their life together, their friendships and relationships, and sheds fresh light on the ideas and beliefs of one of the twentieth century’s greatest philosophers. "The letters reveal Heidegger as a whole in an unprecedented fashion, but also evoke the character and qualities of his wife." "Heidegger's letters to his wife are a revelation. They offer privileged access to the innermost reaches of Heidegger's thought. Moreover, here, perhaps for the first time, Heidegger the fallible individual is fully on display. These fascinating letters reveal Heidegger's exalted sense of the world-historical mission of philosophy, as well as his own immodest estimation of his standing. This rich correspondence should be required reading for anyone interested in the vital intersection between biography and the history of ideas." "Can a philosopher’s life illuminate his thinking? Heidegger is not encouraging, writing of Aristotle: 'He was born, worked, and died.' Yet in these letters to Elfride, his thinking, tribulations and passions bleed together, exploding any such parsimony. They bear intimate witness to everyday life chez Heidegger, and offer a riveting glimpse of an often unequal struggle with his wife over the meaning of marriage, love and truth." 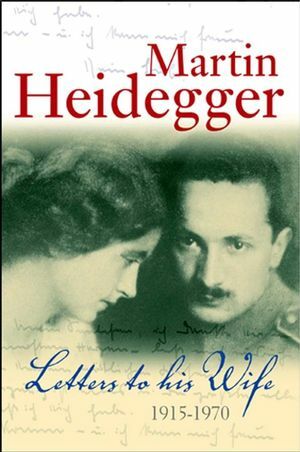 This book makes available for the first time Martin Heidegger’s letters to his wife Elfride. Heidegger is one of the most important and influential philosophers of the 20th century. The letters shed fresh light on Martin Heidegger’s ideas, his personal life, the part he played in the two world wars, his professional career and his relations with other women.